Reproduction of a portrait of African American inventor Granville T. Woods. Woods was born in Columbus, Ohio in 1856. From 1884 to 1890 he and his brother operated a machine shop in Cincinnati, Ohio. Woods received 35 patents for electrical and mechanical devices between 1884 and 1907. 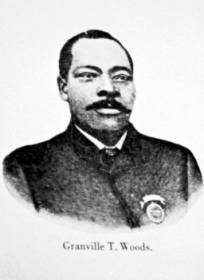 Granville T. Woods was an African-American inventor and was born on April 23, 1856, in Columbus, Ohio. He left school when he was ten years old and went to work to help support his family. Woods became an apprentice to a machinist. He learned blacksmithing and how to invent and repair machines. Woods continued his education by attending night school. In 1872, Woods became a fireman on the Danville and Southern Railroad in Missouri. He was later promoted to engineer. After only two years with the railroad, Woods moved to Springfield, Illinois, where he accepted a position with a steel mill. By 1878, he had become an engineer on the Ironsides, a British steamship. Within two years, he had become the ship's chief engineer. In all of the positions that he held, Woods experienced discrimination because of his race. Unhappy with his inability to obtain higher positions, Woods moved to Cincinnati, Ohio, where he established his own machine shop in 1880. The shop eventually became the Woods Electrical Company. Woods devoted his energies to developing an improved steam boiler in 1884. He also invented the first electric railway that was powered with electric lines from above the train. Previously the lines had run along the tracks and been quite dangerous to pedestrians. In addition to these inventions, Woods also created the first telegraph service that allowed messages to be sent from moving trains. This invention dramatically improved railroad safety. Woods also invented several improvements to the airbrakes used on locomotives and other large machines. Woods sold his inventions to a number of companies, including the American Bell Telephone Company and the General Electric Company. By the time of his death on July 30, 1910, Woods had received more than sixty patents.